Ceiling fan. The very phrase stirs up all kinds of emotions from lovers and haters of this simple fixture. If you’ve ever watched a home improvement show on television, chances are you have been told by the designer that “the ceiling fan needs to go!” Not so, I say. 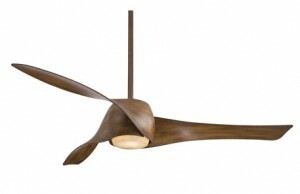 Ceiling fans serve a function and can be stylish – if you know what to look for. While ceiling fans may not be the most aesthetically-pleasing option for a ceiling fixture, they do serve an important purpose in many homes. By circulating the air in a room, a ceiling fan can make the room feel cooler than it actually is; this allows you to keep your air conditioning turned down a little more in the summer and saves you money. In cooler weather, a ceiling fan helps to keep the warm air in the lower part of the room, allowing you to turn down the heat – again, saving you money. And, since ceiling fans cost just pennies a day to operate, they are certainly a good choice when you are looking for ways to conserve energy and cut costs. In our older home, our bedroom ceiling fans are a blessing in the heat of summer. Since the air-conditioning and forced-air heat weren’t an original feature of our 1920s-era home, we were able to get just ONE solitary vent in our upper level (where all the bedrooms are). This isn’t a problem in the winter, since heat rises. But, it is a big problem in the summer – it’s HOT up there! Our lowly ceiling fans make sleeping much more comfortable during the summer months. Unfortunately, the home we bought came with ugly ceiling fans. See? When you head out to shop for a ceiling fan, you have a few things to consider. First, be sure that you buy a quality ceiling fan. While you can find a fan for $50 or less, it simply won’t function the way a better-quality fan will. You may find a cheap fan to be noisy or wobbly as it turns. As with other home improvement items, I recommend that you buy the very best fan you can afford. 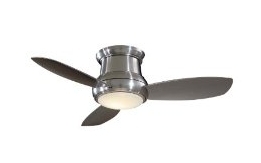 Secondly, you will need to decide whether you would like a light fixture integrated into the fan. If your home, like mine, has no other light fixtures in the ceiling, choose a fan with a “light kit.” If you already have recessed lights in your space, you can forego this option. However, be sure that the fan you install doesn’t hang directly below any of your recessed lights; otherwise, you will end up with a strobe-light effect every time you turn on the fan! Lights come in “direct” options and “indirect” options. Direct lights shine down toward the floor. While they light the floor or other surfaces better than indirect lights (which shine up toward the ceiling), they can cause glare as you end up looking directly at the light bulb. This fan features an indirect light and uplight. If you aren’t sure whether you want a light kit or not, you can always add one later. Just be sure you select a fan that will accept a light kit later and wire your electric junction box to accommodate it. Be sure to look for a fan that is appropriate for the space in which you want to install it. There are options available for outdoor use, but they must be specified for an exterior space. They are wonderful for use in a screened or front porch. Consider the size your fan, as well. 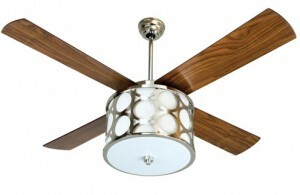 Ceiling fans come in many diameter options and different lengths. If you have very low ceilings, choose a fan that is “flush-mounted” flat against the ceiling to preserve the height of your space. Rooms with higher ceilings can accommodate ceiling fans with longer rods to bring them down from the ceiling and better circulate the air. To decide on the diameter of your ceiling fan, measure the square footage of your space. To do this, measure the longest wall in your room and the wall adjoining it. Multiply those two measurements together to arrive at the square footage measurement. For example, a room with a 14′ wall and a 12′ wall is 14’x12′ = 168 sq ft. Using a chart like this one from Energy Star (choosing an Energy Star rated fan will also help you save energy and money!) or from the fan manufacturer, choose the appropriate fan diameter. In this example, we would aim for a 44″ fan. Now, the fun part – finding a fan with some style! There are two ways to approach the style of your ceiling fan. 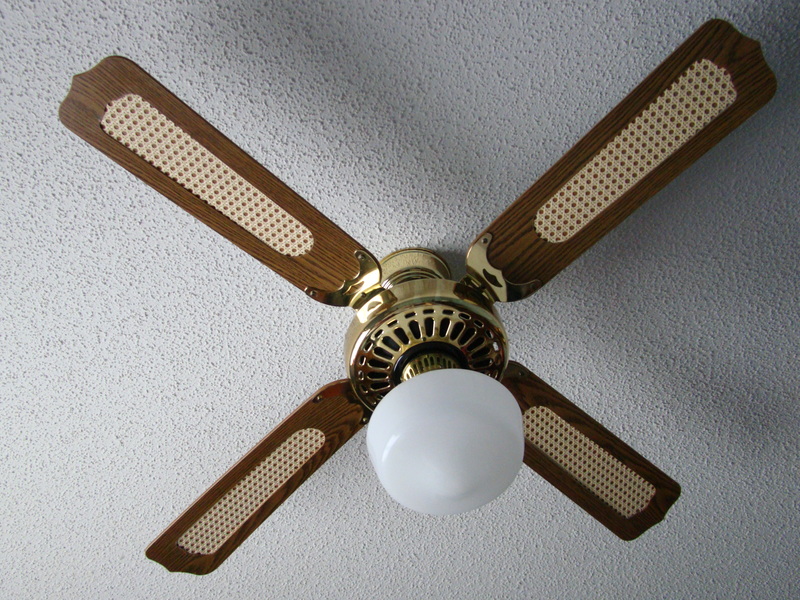 Some folks prefer that their ceiling fans blend into the background and provide function only – not decorative style. If this is your philosophy, choose a fan to match your ceiling color as closely as possible. Often, this will mean selecting a white fan. If you prefer to make your ceiling fan a part of the decor in your space, choose a fan with a style to coordinate with the style of your home. In a traditional space, choose something with more detail and perhaps etched or art glass shades on the light kit. For a more modern aesthetic, consider a fan with clean, simple lines. Coordinate both the metal and the wood finish (if appropriate) with the finishes already in your space for the best result. See? Ceiling fans CAN be a part of a stylish home. By making wise choices on the function, size and style of your fan, you can enjoy a more comfortable and design-inspired space. Installing a ceiling fan make our room be more beautiful!